Notes: This pattern is designed by flyfishing guide Kyle Giampaoli. It is marketed by Montana Fly Company and the nymph is sold through many Sierran flyshops. 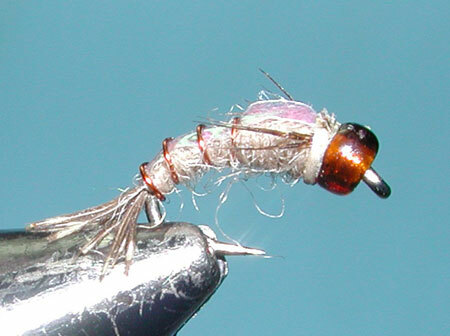 A popular BWO nymph, particularly on tailwaters. The nymph has a high degree of attraction from the Rootbeer colored Glass bead and the Pearl Mylar wingcase. The copper wire also provides some attraction as well as segmentation.